Here is a second update on the activities of the Choctaw County Historical Society on April 4, 2009. The Harvey House Restaurant in the Hugo Frisco Depot has been fully restored by the Choctaw Country Historical Society, which now owns and operates the depot as the Frisco Depot Museum. New Hugo SL&SF station (from the NAU Cline Collection). Used by permission. Once a main hub for the St. Louis and San Francisco Railroad, commonly known as the Frisco, the old depot in Hugo, OK has been converted to a museum with a "Harvey House" restaurant. The museum chronicles the history of Hugo and Choctaw County. 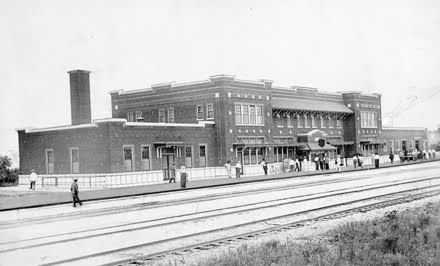 The Frisco built its first depot in 1903, but it burned seven years later. It was rebuild but burned again in 1914. In 1917, the railroad replaced the previous wood structures with a two-story brick depot. At the time, it was one of the finest on the Frisco line. The spacious depot housed several railroad offices, including a telegraph office and a ballroom for railroad parties and functions. There were large, segregated waiting areas and rest rooms and a Harvey House restaurant and newsstand. Fred Harvey operated a chain of restaurants and hotels, mostly for the Santa Fe Railway. His "Harvey Houses" were the first to offer railroad travelers elegant dining. Museum highlights include railroad artifacts, an arrowhead collection, a bootlegger's copper whiskey still, a miniature railroad exhibit, a miniature circus exhibit, a steam-powered popcorn machine, rodeo memorabilia and historical photographs. Sources vary, but it appears that the Hugo, OK Harvey lunchroom and news stand either opened in 1896 and closed in 1930, or opened in 1902, when the east-west line to Ardmore OK was constructed. Between 1896 and 1930, the ATSF held a controlling interest in the St. Louis and San Francisco Railroad.